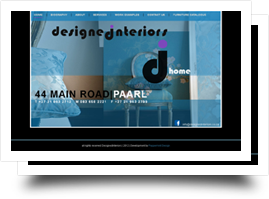 We did this website working with Heletje Esterhuyse of Designed Interiors, a truly talented Interior Designer from the Paarl in the Western Cape. Gillian Coetzee provided beautiful photos she took of Designed Interiors work to form the backbone of her Photoshop design for the website. I did the development for the website, using html css and some jquery for the galleries.